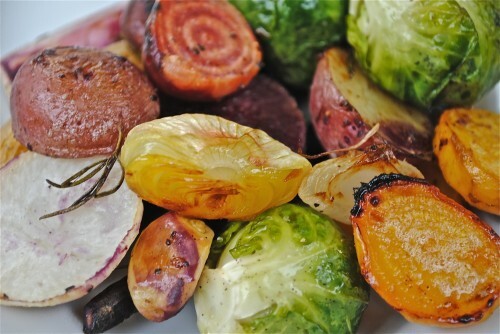 Can’t you just smell fall in the air, looking at these roasted vegetables. This is the time of the year in Texas that I start feeling like it is fall. Some of the leaves are falling, a few trees may be changing colors, and the temperatures have gotten out of the 80’s and 90’s, and these wonderful vegetables can be found very proudly sitting in the produce isle just begging you to buy them. Some graffiti eggplant, golden beets, red beets, miniature onions, maroon carrots, a few potatoes and Brussels sprouts. I do roasted vegetables just about any time during the year but for some reason it seems like they are perfect for the fall season. All the beautiful colors and shapes that you find in your produce section just makes you want to gather up a bunch and take home to roast for dinner. Recently, I was at gourmet grocery waiting to take a class in their Viking Cooking School. I had some time to kill and I love walking around in this store so I was looking for some vegetables to cook for dinner. I came across these maroon baby carrots. I have never seen purple carrots before and since purple is my favorite color, I just had to pick up a bunch. Along with a graffiti eggplant, some golden beets, red beets, some little onions, and a few potatoes and Brussels sprouts, I had my next side dish to go with a healthier Thanksgiving meal this year. My daughter recently suggested that we try some healthier versions of our old standards. One recipe she suggested was for roasted sweet potatoes with shallots and maple syrup. Who needs all that sugar, butter and marshmallows that normally go into a sweet potato casserole anyway. We are definitely trying that recipe for turkey day and these Rosemary Roasted Vegetables will definitely be on our menu. So, my first experiment was this recipe for roasted vegetables using beets which I had never roasted before. The next time I do these, I’m adding some zucchini and maybe butternut squash. 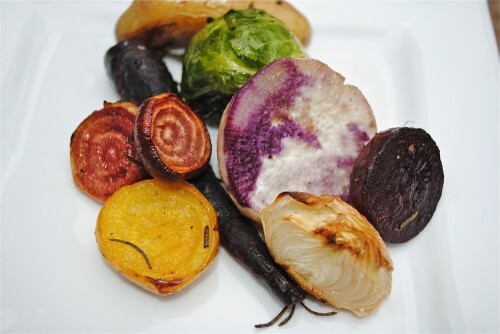 I also think it is a good idea to start the firmer vegetables first because they need a little more roasting time. Then add in the softer veggies. I just scrubbed the maroon carrots and did not peel. I knew if I peeled them, there wouldn’t be anything left. Scrubbing did the job just fine. I tried to keep the vegetables separated from the red beets because I didn’t want them bleeding on each other. Then after they have roasted, stir them together. Peel and cut up vegetables, sprinkle with Kosher salt, freshly ground pepper and some fresh rosemary and drizzle all over with olive oil. 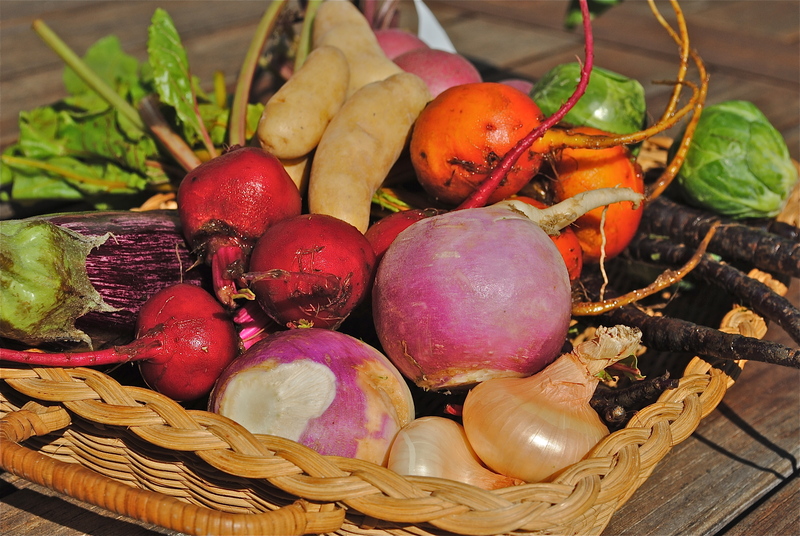 Peel the beets and turnips and keep separated. Wash and scrub the carrots that are too small to peel. Peel the eggplant (if using large eggplant) and cut into cubes along with the beets. Leave the carrots whole unless you have used large carrots. For the small onions, just peel and cut off root end. Rinse off the potatoes (I had fingerlings and new potatoes) and either leave whole or cut in half if too large. Rinse and pat dry the Brussels Sprouts. Put all the vegetables on a rimmed cookie sheet, drizzle with olive oil and sprinkle the fresh rosemary over the top of the vegetables. Toss in the peeled garlic. Roast at 375-400° for about 20-30 minutes or until crisp tender. The next time I make these using the smaller vegetables, I’m going to add them in for the last 10 minutes of roasting so they don’t overcook and they stay a little crunchy. I think adding zucchini, some butternut squash and maybe some bell peppers would make a great addition to this recipe. 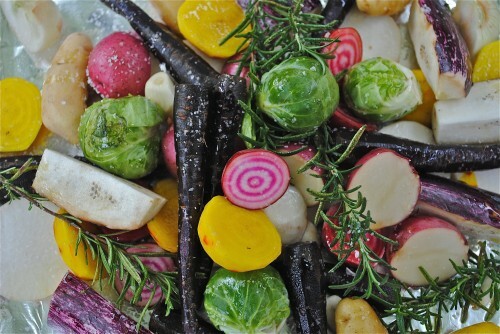 Your nephew Colby was supposed to bring Brussels Sprouts this Thanksgiving Holiday…Instead, he brought “Rosemary’s Root Vegetables” and took boring Brussels Sprouts into an entirely new light. There has never been a more pretty nor tastier dish to this table of Bostonians (a big bunch of Yankees) who pride themselves on presentation and flavor. Thank you Sherry for adding the highlight of our feast from afar. This recipe has already made it’s way to so many of the guests north of the “Mason-Dixon”. I look forward to using the recipe in “Pea in a Pod” as well as “Double Delight” in the near future.